Today I realized that I had miscalculated rather badly when planning my whole dressmaking and cake saga. My plan was to spend most of the day sewing and the rest of it making flowers for the cake. What never occurred to me was that other people would have need of the same space that I was counting on, and for equally legitimate reasons. When I needed the dining room table, it was full. Thinking I’d be able to adapt in my sewing, room, I found it also occupied. When I thought I’d go work on icing, there was too much going on in the kitchen. So, I had to adjust. The first adjustment was to change the order of my day and the order of working on the dress. I ran errands and got supplies for the cake. I made a test gluten-free cake to see if it would work for the gluten-free layer of the wedding cake. I worked on a part of my dress that I could fit on to my sewing table instead of working on one of the bigger pieces as I had planned, and as I did so a realization came to me, and that realization was that if I am going to do what I must do before Sunday, I am going to have to become nocturnal. So, it’s after midnight and I am waiting for something to dry so I can go back to my slow and steady work on the dress. Every seam must be basted. Right now I’m in the middle of the thrilling task of sewing in a zipper by hand. It will be interesting to see how long I last. What a busy day it was today. We started off as a household of 9 and ended up with 12. Jordan and Lina set off fairly early this morning for the Dallas airport to pick up three sweet sisters who will be staying with us and helping us until the wedding. While they were gone, I made a batch of gluten-free bread and then took Mary to the dentist, whom she hadn’t been to for six years. I left her to her doom and went to Walmart to do some shopping. Our guests have multiple food sensitivities, so planning meals is going to take a lot of thought. Just as I finished shopping, Mary finished at the dentist. When I went to pick her up, I found her with a bleeding and swollen lip. Apparently something “slipped” and cut her lip. I sure hope it heals before the wedding! Today being the only day it would really work out to do this, I wanted to take Mary out for a mother-daughter lunch, but first we had to wait for her to get the feeling back in her mouth! Eventually we made it up to the Genghis Grill where we had a great gluten-free meal before stopping at Hobby Lobby to return the wedding bubbles I had bought yesterday. They were much cheaper at Walmart. By the time we returned home, Lina and Jordan were here with Rebekah, Ruth, and Sarah. As I anticipated these lovely girls jumped into action almost immediately. Rebekah began making beautiful flowers out of sheet music and Ruth and Sarah helped with the measuring. There was a lot of measuring. This is an aspect of wedding preparation that I hadn’t thought about. The aisle of the chapel had to be measured, as did various light strings and who knows what else. I hunkered down in my sewing room with chiffon sleeves that had to be seamed and hemmed. You wouldn’t think it would take hours and hours to do this, but it did. The seams had to be pinned, then basted, then sewn, then ironed, then trimmed, then sewn again. The hems had to be sewn, then folded, then sewn again, then folded again, then sewn again. This is very time-consuming even on cooperative fabric, but with slippery chiffon it is death by tedium. I am so glad that I met my goal for the day, even if it was after midnight when I did so! Now someone else can work on beading the sleeves while I do other things tomorrow, like sewing the actual dress together and designing a cake and making the icing flowers for it. Oh, and trying to find shoes and a bowtie for Jasper and a few other odds and ends like that. And trying out a gluten free cake recipe for use on one layer of the wedding cake. Today is my daughter Lina’s birthday. She celebrated it by going with Mary and Jordan to a Renaissance Faire that is much bigger and farther away than “our” little faire. We celebrated it here yesterday in our usual crisis-laced style. For her birthday dinner, she had requested our world famous chicken enchiladas, and I had enough ingredients to do both “real” and gluten-free versions. She also had requested a gluten-free and egg-free cake, because her friend Rae was coming and Rae is deathly allergic to eggs. Well, after lunch I turned on the oven to preheat and mixed up the cake batter. After an hour, the oven still had not reached 350°. This was a problem, because the cake really needed to be done before the enchiladas went in. We started assembling enchiladas and still the oven was not preheated. The girls’ friend Bethany came over and offered the use of her family’s oven (about 3 blocks away), so Mercy went home with her to bake the cake, which by now had been sitting out for over two hours. We gave up on the oven and turned it off, while making plans to use our two roaster ovens to try and get enough enchiladas baked for 11 people. Walter took at look at the oven, trying to figure out if there was a gas leak, but didn’t find anything. However, when he put everything back together and turned on the oven, it heated up to 350° in ten minutes! So, in the end we baked the enchiladas in the oven after all, the cake came back from Bethany’s house fully baked, Rae and her husband Justin got here, and we all sat down to a good hot meal and good warm fellowship. After supper we sat and visited awhile before having cake, and were surprised by a visit from college student (MK from Zambia) and his dad. The cake was surprisingly edible for not having anything in it (no gluten, no dairy, no eggs!). It didn’t hurt that we had ice cream to go with it too. Today I was up and working on the dress first thing. The underdress is almost completely done–just need to do some hand sewing on it. I did several other chores as well while Walter spent the morning doing some extra jobs for his cleaning business. “Holiday” is kind of a misnomer around here. We did take some time in the afternoon to get some wedding stuff at the craft store and then go to see a movie together–a rare treat for us. After a quick supper I took Jasper and Lucy with me to the mall in search of dress pants for the wedding. We found a nice shirt, but no pants in the mall that were his size and also dressy. Apparently young men his age just don’t dress up at all. We tried another store on our way home with the same discouraging result. We may have to resort to ordering online tomorrow and getting two day shipping! Shortly after we arrived home, the faire-goers also arrived and I talked a very tired Lina into helping me cut out the overdress. The chiffon overdress. It would be hard for me to overstate my loathing for chiffon. It is so horrible to work with and I have so little time left. Prayers would be appreciated. Remember, I haven’t even started on the cake yet either! Tomorrow is Lina’s birthday, so I asked her to choose the hymn for today. With heavenly peace and love? Moved Thee to give Thy Spirit thus. Our God, for all Thy grace! For all Thy boundless love to us. After less than five hours of sleep, I staggered off to Walmart this morning and bought groceries before coming home to take a nap. I was too exhausted to be of any use at the sewing machine. After a nice little rest, I did get up and get to work. It is very slow and painstaking, because every seam needs to be basted if I don’t want the fabric to slip. I was also baking two consecutive pans full of chicken pieces which will be needed tomorrow. After lunch, everyone else who was still here (Walter and Spencer were at work) packed up and went out to the lake, leaving me here with my sewing and my chicken. I got the dress basted and sewn. It just needs hemming and binding at the sleeve and neck openings. I picked the meat off a seemingly endless array of chicken pieces. Walter and Spencer arrived home late afternoon, and mowed our yard. The three of us were supposed to join the others at the lake for a picnic supper and front row seats to watching the sun set over the lake. Lina texted me to say that they had a little rain at the lake but it had moved off. So we got into the car and headed up toward the lake despite glowering skies and the occasional rumble of thunder. When we were about one third of the way there, Lina called to say that it was pouring at the lake and they were going to head home. So we turned around and came home, driving through a downpour on the way. Instead of a picnic at the lake, we ate our picnic food in the dining room. Then most of the gang went out to see a movie, leaving me here to do more sewing. The only problem was that my headache was back in full force and I felt very feverish. I don’t know if I actually had a fever, but I felt as if I did. Please pray that I will NOT get sick because I have too much to do in the next few days! So, I’m kind of thinking I’ll try to go to bed a little less late tonight . . .
It’s always a bad sign when I wake up with a monster headache. It’s a worse sign when I decide to sleep in a little bit, and the headache only gets worse. This was not an auspicious start to a day in which I had to teach for several hours. Today was the day that I had set for my “Eloquent Epistles” workshop, a day-long foray into the joys of writing real notes and letters. Even a large dose of meds and a larger dose of tea did not fade my headache, so I just took a deep breath and went forward with my preparations. My students today were five lovely young ladies, all of whom I have taught before and all of whom I am very fond of. We worked our way through various kinds of letters, from thank you notes to notes of encouragement and apology. During the breaks, the girls played outside and I tried not to scream in pain while preparing for the next session. Meanwhile, Mary and Jordan went off to meet with the professor who will be officiating at the wedding, and Lina went off to meet up with her old piano teacher, who is a dear friend and I was so sorry to have to miss it! During the last break, I got the bright idea of letting them try writing with a fountain pen, because I love fountain pens and want them to be loved by the new generation. So, I frantically went through my pen stash and was actually able to locate five fountain pens. One of them had been neglected for so long that the ink inside was dried and the plunger couldn’t go down because of it. I had to spend several minutes flushing it out with warm water before it was operational again. The fountain pens were a big hit. I also had three kinds of dip pens that they could try, along with different colors of ink. I felt pretty smug. More people would write with fountain pens if they actually tried them! 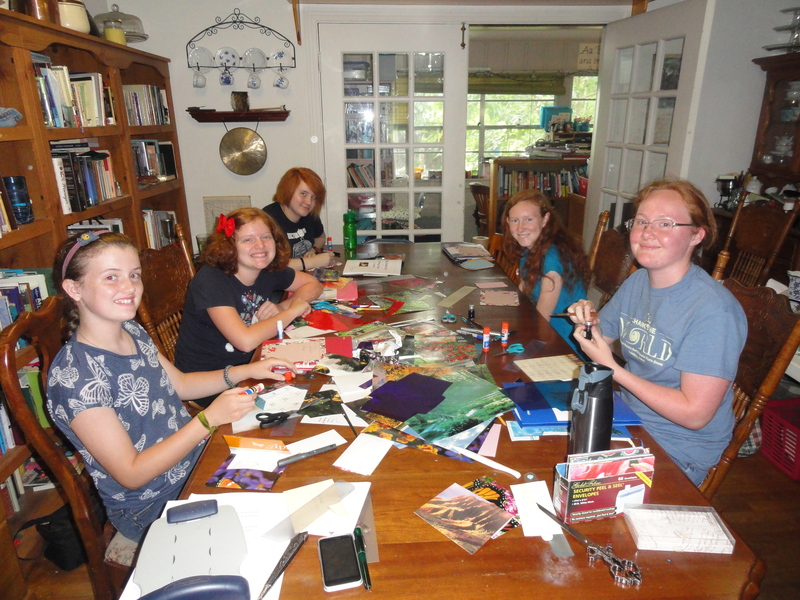 We also made envelope templates and then made envelopes using a small fraction of my massive “potential envelope” stash. By the time the girls left at 4:00, my headache was a little less overwhelming, which was a good thing, because of course I still have a lot of wedding sewing to do. Which brings me to a dark place at the moment. The first thing I needed to do on the underdress was to sew the center back pieces together and then do the zipper. I was very, very careful. I sewed the back center seam and then carefully basted the zipper in place. I carefully sewed the first line of topstitching and almost cried when I saw how puckered it was. It was awful. I decided to sew the topstitching on the other side with the fabric upside down in case that had a better outcome. I carefully sewed the full length of the 22 inch zipper and then turned the fabric right side up to see how it looked. It looked horrific, because (and I can’t tell you how much I hate to admit this) I had sewn this second line of topstitching on the exact same side of the zipper as the first! Furthermore, I had somehow reset the stitch length without realizing it and the stitches were infinitesimally small. In normal circumstances, when I do something this stupid after 46 years of sewing, I assume this means that God does not want me to sew right now, and I go have a good cry and forget about my project for a few days so I can recover from the trauma. But today, not only did I totally make a massive withdrawal from my LSA (lifetime stupidity allowance) while working on my daughter’s wedding dress–I did it while under extreme time pressure, so there was no hope of setting it aside. All I could do was take a deep breath, pull out my seam ripper, and stare at that zipper till my eyes almost dried up. White fabric. White zipper. White thread. On the right side, the thread sank into the satin so it was impossible to pick out without damaging the fabric. On the wrong side, the thread was indistinguishable from the zipper tape. I had to pick out two long lines of tiny stitches with painstaking slowness–one stitch at a time. It took over three hours. I wish I could tell you that when I finally got the seam picked out, I redid the topstitching and it looks fabulous. If I did tell you that, I’d be lying. I got the topstitching re-sewn, all right. It looks like it was done by an eight-year-old who drank a couple of Monsters while eating a large bag of Skittles before sitting down at the sewing machine. My only consolation, if such you can call it, is that this is after all the underdress, which means that it will be somewhat obscured by the chiffon overdress. And if you are coming to the wedding, I just have to beg you to please not look at the zipper on the back of the dress! But when you’re the father of the bride, you do. Especially if you promised your daughters a long time ago, before they suddenly turned into young women, that you would wear a suit to their weddings. We’ve known for many months now that the suit issue would have to be addressed. Walter knew he had no choice. He stopped wearing a suit and tie over twenty years ago when his last suit wore out. His “last suit” was the one he bought for another wedding–ours, back in 1981. In the intervening years, he has grown used to the comfort and informality of wearing a nice pair of pants and a collared shirt for “dressy” occasions, but he knew that someday, one of his daughters was likely to get married. The discouraging thing about the whole business is that on both occasions, a family member had to step forward to pay for the suit. Thirty-two years ago, we didn’t have the money to buy a suit for Walter to wear to our wedding, so we were planning for him and his brother to rent tuxes (we each had only one attendant). Instead, a family member stepped in and offered to buy suits for the two of them. Walter’s gray “wedding suit” lasted him for many years but eventually it wore out. This time, I was thinking that we would just have to be really faithful about checking at Goodwill and other resale shops, when once again a family member pitched in with a gift to allow Walter to buy a very respectable suit. So today was the day. He took the afternoon off work. Then our friends Steve and Diane showed up. They were leaving on a trip and wanted to leave their car with us while they drove a rental car. Of course this led to a lengthy visit in the driveway because we hadn’t seen them in awhile! It was well after 3:00 when we finally took off for the mall. Gone are the days when a knowledgeable and desiccated gentleman would pounce on you the moment you stepped into the menswear department. Instead, we fended for ourselves for quite a while, trying to figure out what size Walter actually needed, since small-medium-large doesn’t work for suit jackets! It was very hard to find any that seemed suitable in the right size. Finally, we went in search of help and enlisted the services of a cheerful young lady, who verified my opinion of the correct size. The only problem was that they did not have the correct pant size. The other problem was that if we wanted a 20% discount, we needed a store credit card. I knew I had had a credit card from that store at some point, so after checking another store (way out of our league price-wise) we drove all the way home to get the card–which I could not find. I’m sure it had been well over a decade since I last used it, so I must have thrown it away. We drove all the way back to the store and then I had to apply for a new credit card (which will be destroyed within weeks!) in order to get the discount. Then came the fun of choosing the shirt and tie. The suit is navy, the shirt is gray, and the tie is striped. Once again, we weren’t sure of the shirt size and Walter ended up having to try on two shirts before we hit the right size for him. The pants have been ordered and will be shipped to us, at which point the hems will have to be lowered as much as possible because they are out of stock in the length he really needs. In the “discard” area of the changing rooms there was a hat–a gray fedora. Walter picked it up and put it on just for fun, but found out to his surprise that it actually fit him. (He has a very large head and most hats are too small.) It not only fit him; it looked pretty sharp too, so he ended up getting it. I guess if you’re going to dress up, you might as well do it right! More candle holders were dyed today. Mary’s friend Joy came to visit and work out the music for the wedding (she is playing the piano). I did a lot more cleaning in my sewing room because I really, really don’t want the dress to get smudged while I’m working on it. Now my sewing room looks better than it has in years! I’m looking forward to sewing some other stuff on my list after the wedding. Tonight all I got done was the stay stitching on the underdress, which is okay because that means tomorrow I can just jump into sewing the pieces together. The sewing will have to be done early and late tomorrow, though, because I am teaching a class all day–my letter writing class. This is one that I really enjoy teaching and I am looking forward to it. Today we really made some headway on our preparations for the wedding. I did some more pattern altering this morning, and then this afternoon we painted the candle holders. We found we had to really thin the glass paint down a lot. We had two shades of green and two shades of blue. Jordan arrived around suppertime, and we all perched in the living room eating our baked potatoes because I had commandeered the dining room table for white satin. There was a trip to Walmart to buy a new air mattress for Jasper because the one he slept on last night let him down rather badly. He was thrilled to have a new one! I also loaned him my eye mask since the schoolroom is not really that dark until everyone goes to bed. We baked the candle holders in the oven this evening to set the paint and in the morning we get to see what they look like. I hope they are useable! I spent a fair amount of the evening cleaning up my sewing room because I don’t want the white fabric to get dusty or dirty. Then I finally did it. I cut into the white satin, which is what the underdress will be made of. Once I get that made, and am reassured that it actually fits, I will cut out the chiffon overdress. I’m trying really hard not to dread that part, but it’s not working. Tomorrow, I believe there will be a historic shopping trip. I sure hope I find my camera before then. The whole glass adventure continues. First thing this morning I washed a bunch of jars that that still had labels or sticky stuff on them. After lots of scrubbing, I had clean jars. This afternoon we started sanding. Sanding glass is very tedious and slow. On the other hand, it can be exciting. You can cut yourself and start bleeding without even noticing it! I also scored the rest of the jars I had and Lina and Mary got them cut. We’re pretty good at this process now. Tomorrow we should finish the sanding and get to start dyeing the glass. That’s the part I’m looking forward to. I got Mary to try on the new mockup bodice and also the original mockup with the newly altered sleeve. The altered sleeve is an improvement so that detail is now dealt with. Despite taking in the bodice quite a bit, it needs to be taken in some more, and there is a slight flaring at the neckline that needs to be fixed. Why can’t we ever just cut out a pattern and have it work the first time? *sigh* At least I am very close now to being able to cut out the “real” dress. The big news of the day, however, was the weather. After the horrific and tragic events in Oklahoma yesterday, everyone here was very nervous about the approaching storms. Many events were cancelled, and people who had storm shelters were hunkering down in them. First the storm was supposed to start at lunchtime, then in the afternoon. The wind and rain finally came in at suppertime. It was a wonderful series of thunderstorms, with lots of delicious rain. Lucy and Jasper played outside and got soaked. At no time did we feel the storm was veering from “magnificent” to “scary.” It was a blessed reprieve from the heat. I’ll be honest. I was very discouraged last night. I was a faced with a task that seemed impossible. The neckline of Mary’s dress pattern needed to be raised. That would normally not be a problem, but her dress has princess seams, which means the neckline is in three pieces in the front, and it was very difficult to figure out how to raise the neckline and still have the pieces fit together properly. I did research online. I consulted my fitting and altering books. Nobody mentioned altering the neckline. This was more than a little daunting. If there were no tutorials about this process, then it must not be commonly done. I stayed up way past midnight sketching and drafting and trying to figure out how to make it work. This morning I was up early. I considered calling my mother, who is my ultimate expert in all things sewing-related, but I wasn’t sure how much help she could be on the phone. I made a final decision on the lines I had drawn the night before and went ahead and cut out another mockup of just the bodice. With a sense of deep foreboding, I did all the stay stitching, clipping and basting. Then, I took a good look at it, and guess what? It didn’t look too bad. It looked like a pretty “normal” neckline. Whew! Then I was busy preparing for my first Story Quest class of this summer. It’s a little smaller class this year, but I am still excited about working with these kids. We wrote a class story about a kid in the future who dreams of seeing and growing real grass. After supper I finally hauled out the hair cutting stuff and attacked Jasper’s mop. I don’t know why I haven’t done it before now. Just laziness, I guess. But the reality is, I don’t want people to see the wedding pictures and think that Mary is closely related to Cousin It. This evening we finally decided to do some glass cutting. I have been saving glass jars and bottles for weeks, and got a bottle cutter way back in January, I think, so that we could turn jars and bottles into candle holders for the reception. It’s a good thing I saved so many jars, because there is definitely a learning curve. Mary and Lina finally figured it out, so I did the scoring and they did the heating and cooling, and we ended up with quite a few usable candle holders. Now we really kind of need some more jars, because so many broke at the beginning! Once we were done with jars for the night, I went back in my sewing room and finished sewing the bodice mockup so that Mary can try it on in the morning and I can make any remaining adjustments before cutting out the real dress. Once I’ve got the pattern right, the actual dress will not be that difficult to make. Tomorrow: more sewing, more glass, and possibly a momentous shopping excursion.